Ecalpemos: Capital punishment possibly not being restored. Just noting that Paul Staines' petition to have a parliamentary debate on the restoration of capital punishment has only reached a quarter of the 100,000 signatures required with only four weeks to go. 25,956 votes out of a population of 62,218,761 means that, in spite of the impression given by many popular newspapers after some heinous crime has been committed, there is no widespread support for even discussing the issue in parliament - let alone actually restoring the death penalty. Hopefully Mr Staines will accept the vote of the public come February 4th. The assertion was stood up by taking figures from 1964 – which was the date of the last hanging, and not the date of actual abolition, which came in 1969. Moreover, the period on which Restore Justice is basing its claim ends in 1997, which is fourteen years ago. Murder rates since then have not been considered by the campaign. Does this matter? 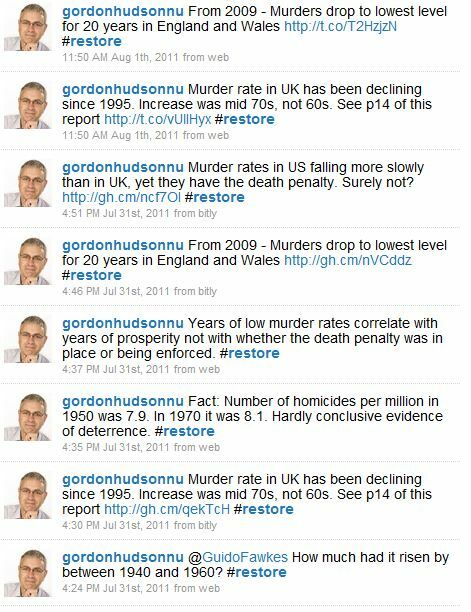 Well, yes it does: in 2008/9 the UK recorded its lowest murder rate for 20 years. The intentional homicide rate for the UK fell from 1.71 per 100,000 inhabitants in 2000 to just 1.17 in 2009. By contrast, the USA, where many states still execute, went from 5.5 to 5.0 in the same period, while Russia, which also executes, went from 28 to 15. This article bears out my Twitter tirade against Staines last July when I queried his position after reading the latest Home Office statistics. You can follow the Restore Justice campaign on Twitter here, but they have not posted anything since last November. 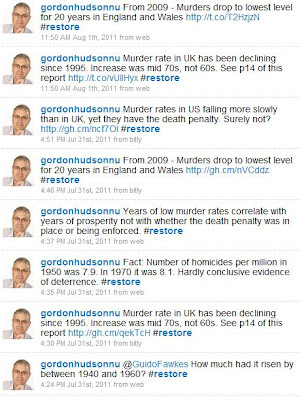 *My tweets on this issue from the start of the campaign in July 2011 (click on image to see full size).